I was trying to profile my NodeJS app using Node 0.11's flamechart, according to https://github.com/thlorenz/v8-perf/issues/4. What you are looking at is thlorenz's example run. The black rectangles below show what appears to be user code. Their width shows how much time they are responsible for. 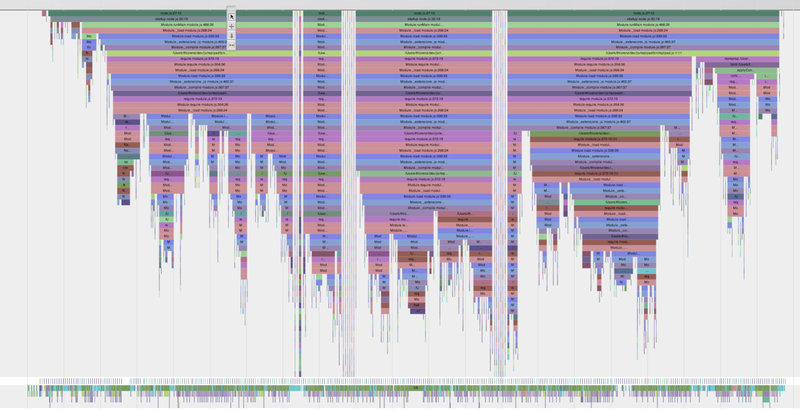 When you get it running with your code, you should see something similar. I hope you have a good understanding of what flame graphs tell you, and what they don't. Not the answer you're looking for? Browse other questions tagged node.js v8 profiler or ask your own question. Why doesn't Microsoft's NodeJS-Typescript starter project use types?